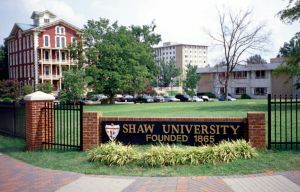 Shaw University is a private, four-year coeducational historically black liberal arts university located in Raleigh, North Carolina. Founded in 1865, Shaw University is one of the oldest historically black colleges and universities (HBCUs) in the country. Shaw was originally founded as Raleigh Institute, a school designed to teach freedmen theology and biblical interpretation. The school’s name changed to Shaw Collegiate Institute in 1870 and five years later it adopted its present name, Shaw University. The college offered its first post-secondary instruction in 1874, and the first baccalaureate degree was awarded in 1878. Initially founded by the North Carolina Baptist Convention and still closely affiliated with the Baptist Church, Shaw University is accredited by the Southern Association of Colleges and Schools. This school offers two-year Associates’ degrees in addition to four-year Bachelor of Arts and Bachelor of Science degrees. The institution currently has specialized degree options in engineering and computer studies; international relations; pre-therapy; radio, television, and film; and speech therapy and audiology. Individualized majors are offered in 34 programs, ranging from education to theology to electronic communications. The university also has a specialized program titled CAPE, which is the College of Professional and Adult Education. CAPE allows participating students to pursue degrees through independent study, flexible scheduling, and credit for prior experience, and offers courses in nine locations. Shaw has been the site of many notable achievements in African American history. It is credited as having the first four-year medical school for African Americans in the nation, Leonard Medical School, which operated from 1882 to 1914, as well as the first university to build a female dormitory on a coeducational campus, built in 1873. In addition, the Student Nonviolent Coordinating Committee (SNCC) was established after a conference which was held on Shaw’s campus in 1960. In the Fall semester of 2008, Shaw University had an enrollment total of 2,702 students. Of these, 63 percent were female and 37 percent were male. North Carolina residents constitute 67 percent of the students. Shaw employs 114 full-time faculty, with the average student to faculty ratio of 15 students per faculty member. Shaw has many prominent alumni from its long-standing history. Among these are civil rights activist and leader of SNCC Ella Baker, former President of the United Nations General Assembly Angie Brooks, the first elected African-American member of the New York State legislature Edward A. Johnson, and the first heavyweight boxing champion with a college degree James “Bonecrusher” Smith. Shaw University Webpage, http://www.shawuniversity.edu; Toni Hodge-Wright, The Handbook of Historically Black Colleges and Universities (Seattle: Jireh and Associates, 1992); Julian B. Roebuck and Komanduri S. Murty, Historically Black Colleges and Universities: Their Place in American Higher Education (Westport, CT: Praeger Publishers, 1993).